There are many hotels in Canmore, but there is only one Mountain Zen. This is your destination ~ the beginning of an adventure that will rejuvenate your soul and replenish your spirit for living. It is a place to return, time and time again. Welcome to Mountain Zen at Silver Creek Lodge. Check-in time is between 4 PM and 8 PM. Check-out time is before 11 AM. At check-in you will be asked to provide proof of identification and a credit card. The Front Desk will then take a preauthorization (this is not a charge on your credit card, it is a hold) for the full amount of your stay plus $25 per day for incidentals. Our Front Desk hours of operation are 7:00am to 11:00pm daily. If you will be arriving outside our regular hours of operation, please call the Front Desk directly using our toll free number 1-877-598-4242 or (403) 678-4242. You may also email us at reservations@silvercreekcanmore.ca. The lodge offers a full fitness gym and an outdoor open-air hot pool available for guest use. The hot pool is open from 8:30 a.m. until 10:00 p.m. and the gym is available between 9:00 a.m. and 10:00 p.m.
Silver Creek Lodge's Hotel Rooms feature a King size bed, electrical fireplace, soaker tub & shower, tv / DVD stereo, wireless internet, coffee makers and bar fridges. Ideal and comfortable, they are the perfect accommodations to explore Canmore from. Silver Creek Lodge's fully self-catering one bedroom condo suites feature King or Queen sized beds, electrical fireplaces, full soaker tub & shower, full kitchenettes, in-suite laundry, patios, stereo, tv & dvd players and free wireless internet. These one bedroom condos are ideal for both short and long term stay and can accommodate four guests very comfortably. 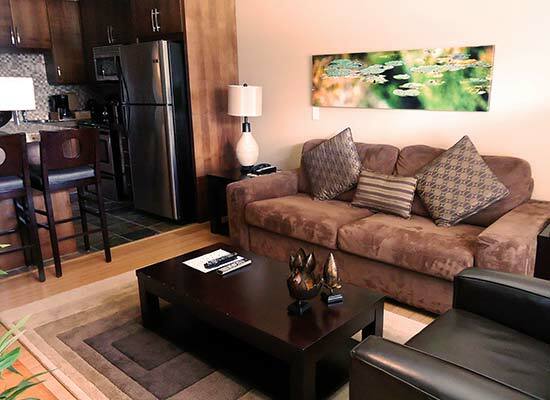 The spacious two bedroom condo suites of Silver Creek Lodge offer full kitchen with dining island and the two full-sized bedrooms make this unit ideal for family accommodations. The master bedroom is furnished with a King size bed while the second comes equipped with a Queen. There is a pull-out sofa in the living room, patio, in-suite laundry, soaker tubs and shower in the washrooms. These large units are the ultimate in Mountain Zen. Whether going on a longer vacation or just a short jaunt to get out of the city, it can be hard to leave home when you can't take your pets with you, afterall they're part of the family too. Canmore's Silver Creek Lodge has recognized this by designating several suites as Pet Friendly hotel accommodations. There is an extra cleaning charge of $25 per night. The number of these suites is limited so please let us know if you plan on bringing a pet at your time of reservation. 25% of our Pet Friendly cleaning charge goes to support our local Canmore SPCA. Silver Creek Lodge is also proud to provide our guests with heated, underground parking. No need to plug in your car or dig it out of snow during your visit to Canmore, with our heated underground parking your vehicle stays as warm as you do. We also have large storage lockers available to keep your valuables safe and secure without having to lug your large items up and down from your room. 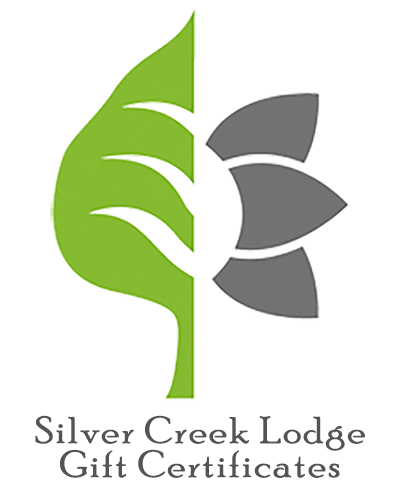 Silver Creek Lodge is proud to offer purchasable gift certificates to our guests. Receive a gift certificate for the amount you purchase which will be valid at Silver Creek Lodge. These Gift Certificates make wonderful gifts for your loved ones at any time of year!